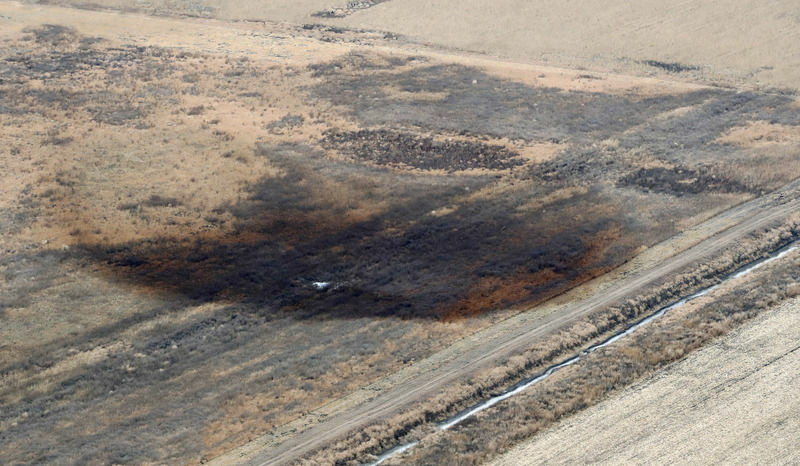 Keystone Pipeline Leak near Amherst, SD - Here you can see the oil soaked patch of land where the leak occurred. The Keystone Pipeline is a network of pipelines that carry oil from the Canadian tar-sands to refineries in the United States. It is owned and operated by TransCanada Corp., a Canadian company operating pipelines, storage facilities and power generation plants in Canada, the USA and Mexico. The operational sections of the Keystone network were constructed in three phases. Keystone Phase 1, runs from Hardisty, Alberta, through Saskatchewan, Manitoba, North Dakota, South Dakota, Nebraska, Kansas and Missouri, to a storage facility in Illinois. While the Keystone-Cushing Extension runs from a refinery in Steele City, Nebraska to Cushing, Oklahoma; and the Gulf Coast Extension runs from Cushing to refineries in Texas. TransCanada is currently attempting to build a controversial fourth phase of the Keystone network, also known as Keystone XL. When TransCanada announced its intentions to construct the Keystone Phase 1 pipeline in February 2005, the proposed route ran through the Brown and Sprink counties of South Dakota. However, when TransCanada presented the proposed route of the pipeline to community members at the Clark Community centre in November of 2005, the South Dakota Public Utilities Commission and community members were surprised to hear that the pipeline was now proposed to run through Day and Marshall counties . TransCanada had not informed the South Dakota Public Utilities Commission of the proposed route change, and representatives had to field dozens of calls from concerned community members . The route was later changed again in 2006, at the request of the U.S. Fish and Wildlife Service because of conservation efforts . In August 2007, the grassroots resistance to the pipeline intensified in South Dakota, as opposition groups learn that TransCanada had quietly been awarded a special permit by the Pipeline and Hazardous Materials Safety Administration to operate the pipeline at a heightened maximum operating pressure (MOP) . Normally, the MOP is limited to 72% of the stress level tolerable before deformation or failure of the pipeline, however, TransCanada had been granted the ability to operate the pipeline at an MOP of 80%. At the same time this information came to light, TransCanada was trying to block a request by Curt Hohn, an official running an operation that delivers treated water from Missouri to rural residents in South Dakota, and a leading voice among the opponents of the pipeline, to release all the names of the landowners along the corridor affected by the pipeline . Hohn and opposition groups wanted to inform those landowners of the dangers of having a pipeline and pumping stations on their land. The South Dakota Public Utilities Commission sided with opposition groups and publicly released the names of all those being affected by the pipeline . In September of 2007, at a public hearing about the Keystone Pipeline, landowners and other opponents to the pipeline argued that the federal study by the U.S Department of State on the environmental, economic and social impacts of the project was incomplete, and should include the potential impacts of a newly proposed refinery in the state . Curt Hohn and other opponents argued that the proposed Elk Point Hyperion refinery should be analyzed in conjunction with the pipeline, insinuating that the two projects were 'joined at the hip' . At the time TransCanada said that it did not intend to supply the refinery with any oil; however, that is not longer the case, which casts doubt on whether or not they were truthful . Others criticized the Governor, legislators, South Dakota members of Congress and county commissioners for not focusing on the concerns of landowners, and for not asking them if TransCanada was treating them fairly. Those landowners who had reached an agreement with TransCanada, were also not spared from criticism by more vocal opponents . On September 12th 2007, to the surprise of many, including the South Dakota Public Utilities Commission, the procedural schedule for the permit hearing was announced without any objections from either sides of the conflict . In the weeks leading up to the announcement of the procedural schedule, saw both side becoming confrontational. However, the details of the process had been worked out in advance between the Public Utilities Commission's lawyers, TransCanada's local attorney and Curt Hohn and his attorneys representing WEB, the rural water delivery network he operates, during a phone conference . The addition of a surrebuttal in the procedural schedule, which granted the ability for the Public Utilities Commission and 'interveners' (opponents) to rebut, after TransCanada's rebuttal, is what allowed the schedule to be announced without any objections . In December 6, 2007 there was an unsworn public input session by members of the community, which was not considered in whether or not TransCanada would be granted a permit to operate the pipeline. 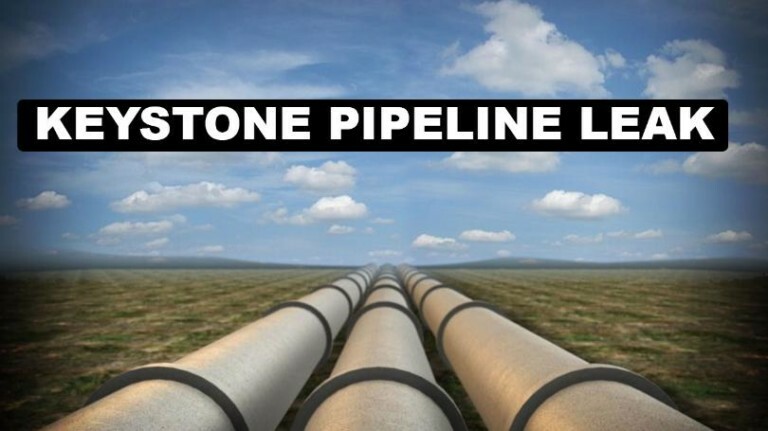 After several public input sessions, the South Dakota Public Utilities Commission granted TransCanada construction permits for the Keystone Phase 1 Pipeline, with 57 additional conditions. Steve Kolbeck, a Public Utilities Commissioner, said that he understood the fears of landowners, but that he was comfortable with the additional conditions placed upon TransCanada by the commission, and that he believed that the pipeline will be operated in a safe manner . However, many landowners were unsatisfied with the conditions placed upon TransCanada and refused to sell their land over concerns over drinking water . 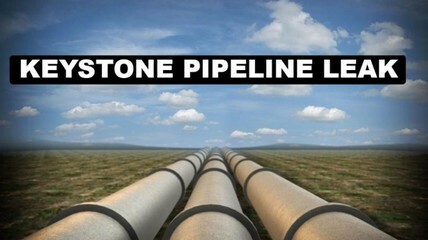 TransCanada sued landowners who refused to sell their land under the eminent domaine statutes, and construction of the Keystone Phase 1 pipeline began in 2008. The pipeline became operational on June 30th, 2010. The oil spill occurred just days before the state of Nebraska voted on whether or not to approve the Keystone XL extension, and despite the incident, TransCanada won approval of its ‘mainline alternative route.’ However, this recent oil spill is just one of many troubling incidents that have plagued the Keystone pipeline during its roughly 8 years of operation, and has regulators in the state of South Dakota concerned about future incidents in the state . So much so that the South Dakota Public Utilities Commission (SDPUC) has warned TransCanada that they have the authority to revoke the permit that allows them to operate the Keystone pipeline in the state if they are found to be at fault for the recent leak . The concerns of regulators are not unfounded, TC had assured regulators that a leak of more than 2’100 gallons would only occur once every 11 years during its operation, and that a leak of that magnitude would only occur in South Dakota every 41 years, but the keystone pipeline has now already had two major leaks in the state, and a third in Montana, this in under 10 years of operation . TransCanada identified that the likely cause of the leak was due to mechanical damage suffered during the original construction of the pipeline in 2008, while a weight was placed on the pipeline to prevent it from floating [1,2]. Opposition groups, which include several Sioux Native American tribes and environmental justice organizations, fear that the continued operation of the pipeline poses a threat to ground water, the livelihoods of farmers, and contamination of the lands of landowners [5,12]. 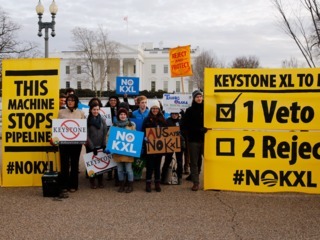 Although the opposition to the already operational sections of the Keystone pipeline has calmed, that is not to say that the fight is over, as opposition groups have turned their attention towards preventing TransCanada from constructing their Keystone XL extension. TransCanada identifies a 400 barrel oil spill near Menno, SD . A corrective Action Order was presented to TC to rectify a leak in a cracked tie-in weld . The Affected Population given is the population of the Town of Amherst, where the leak occurred; however, the pipeline affects a much high percentage of people nationwide. The Financial Institutions listed are those who bankroll TransCanada corp., but not necessarily the Keystone Pipeline. Why? Explain briefly. Environmental Justice has not been served since the pipeline is still in operation. Furthermore, even though the recent spill occurred days before Nebraska voted on whether or not to approve the Keystone XL extension, state regulators chose to grant TransCanada the permit to build and operate the pipeline without considering the recent leak. Office Of Pipeline Safety. 2017. "Corrective Action Order." Pipeline and Hazardous Material Safety Administration. Department of Transportation. 2006. "Special Permit: Keystone Pipeline". Pipeline and Hazardous Material Safety Administration. Axelrod, Joshua. 2017. "S.D. 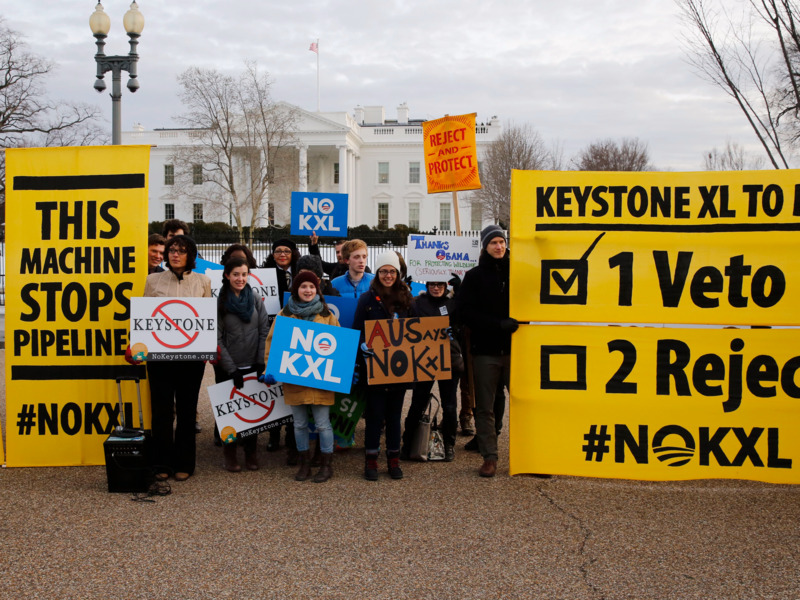 Tar Sands Oil Spill: Bad Omen for Keystone XL Safety". Natural Resource Defense Council. Mercer, Bob. 2007. "Archive: Landowners lash out at pipeline." Aberdeen News. Mercer, Bob. 2007. "Archive: Battle lines drawn." Aberdeen News. Waltman, Scott. 2006. "Archive: Pipeline route changes again". Aberdeen News. Volcovici, Valerie. 2017. "South Dakota Regulators Say They Could Evoke Keystone Permit After Spill." Reuters. Mercer, Bob. 2007. "Archive: Oil pipeline hearing schedule set". Aberdeen News. Arthur, Emily. 2005. "Archive: TransCanada Keystone route to be announced." Aberdeen News. Hetland, Cara. 2008. "SD approves new pipeline." MRP News. EDM Services, Inc. 1993. "Hazardous Liquid Pipeline Risk Assessment." California State Fire Marshal. Axelrod, Joshua. 2015. "New Documents Reveal Serious Corrosion Concerns for Tar Sands Pipelines." Natural Resource Defense Council. Keystone Pipeline Leak near Amherst, SD Here you can see the oil soaked patch of land where the leak occurred.